A few days before the official announcement, LG has teased about its upcoming V40 ThinQ on its official social media platforms like YouTube and Facebook which reveals that the smartphone has five cameras on the rear and front panel. It is the first ever smartphone from LG that has revealed the design of V40 ThinQ before the formal launch event which is set to launch on 3rd October in New York and 4th October in South- Korea. The recently teased images of V40 ThinQ has shown that the smartphone has three cameras on the rear and two cameras on the front. Furthermore, LG has announced that the V40 ThinQ will come with a large 6.4-inch display screen, though the screen resolution and aspect ratio is not available at the moment. LG has officially announced that the V40 ThinQ will be available in Carmine Red, Moroccan Blue, and Platinum Grey color options. Furthermore, a teaser which has been posted by LG, South- Korean giant showed that the smartphone features a rear-mounted fingerprint scanner. So far, the pricing and availability details of the upcoming smartphone have not been revealed by LG. LG V40 ThinQ has been the matter of subject from last few days. 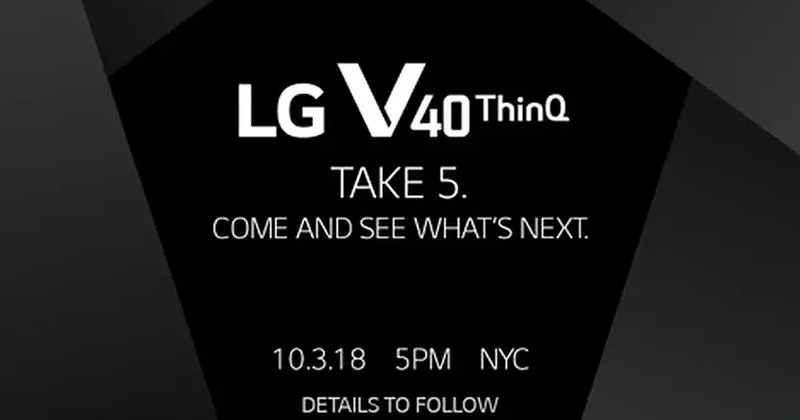 A few days ago, the South- Korean tech giant had confirmed that the LG will be unveiling V40 ThinQ on 3rd October in New York. Just after the announcement of a timeline, the renders have revealed the entire spec sheet of the upcoming smartphone. As the launch date is getting closer, rumors and speculations regarding the upcoming flagship device have appeared on the internet frequently. The entire specifications of an alleged LG V40 ThinQ with the model number LM-V405N have surfaced on Weibo which pointing towards that the device soon arriving in New York and South- Korea market on 3rd and 4th October respectively. If the rumors to be believed then the LG V40 ThinQ will be equipped with Qualcomm Snapdragon 845 SoC coupled with 8GB of RAM. If it happens then the V40 ThinQ would be the first smartphone from LG that comes with such abundant 8GB RAM and 128GB internal storage. The spec sheet reveals that the upcoming flagship smartphone could feature a 6.4-inch QuadHD+ (most probably with P-OLED as well as display notch and anticipating a screen resolution of 1440×3120 pixels and 19.5:9 aspect ratio. The most interesting part is that the spec sheet also reveals that the V40 ThinQ will come with dual- cameras on the rear panel comprising of a 16MP primary sensor and a 12MP secondary sensor. This is in contrast with previous leaks which touted that an alleged smartphone will get a triple lens camera on the rear panel. The alleged LG V40 ThinQ is said to feature dual cameras on the front side including 8-megapixel and 5-megapixel sensors. It is speculated that the device would be packed with a 3,300mAh battery. One must note that the aforementioned information is based on rumors and speculations, however, the actual specifications of V40 ThinQ would be unveiled by LG at the official launch event.